I vote to review Elgos Knights. The Elgos Knights have received 4 Yea votes to review (vegietarian18, capsocrates, Soundwarp SG-1, and infectedsloth) and move forward in the process. For anyone complaining about the realism of the Kobolds - please remember this is the same game where Kaemon Awa loosing two arrows does exactly the same thing as Major Q10 firing two rockets. I'd like to Nominate Jaraptara (Jair-Up-Tara). The Stone Giantess Jaraptara wheeled about, scanning the horizon... There in the distance, silhouetted by the night was a Werewolf Lord and his pack. They plague Feylund. Driven from her cave, last of her Tribe. She has been running, thought to have lost them. No more running she thinks to herself and turns to face the wolves. Reaching down she finds a large boulder. The wolves howl with glee. The first comes within range and she lobs the boulder, it strikes true killing the wolf. Raising her club, she swings and bats the second out of the air as it leaped for her throat... that was the last she saw of the wolves, as Ullar summons her, rescuing her from her fate. 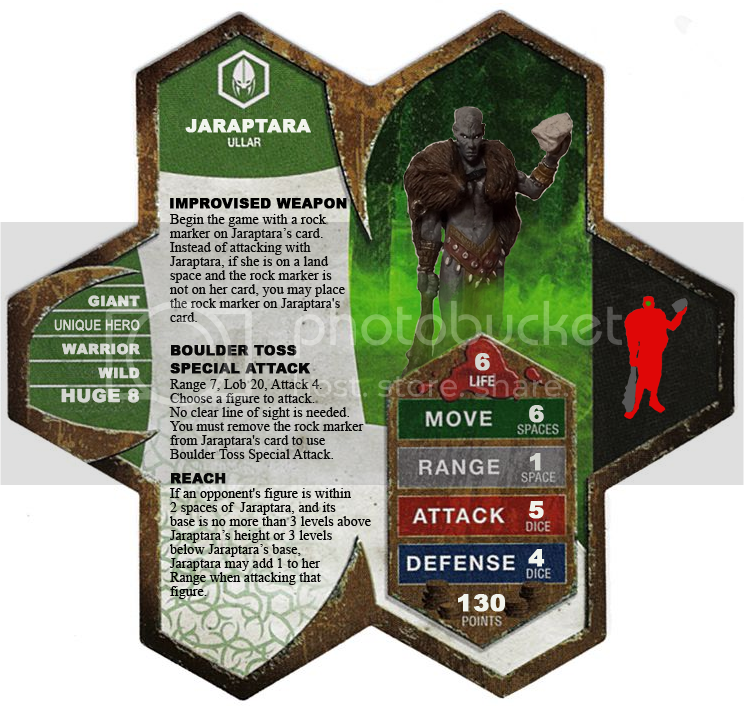 Jaraptara brings a unique blend of range and power, a hybrid hero. Her special attack allows her to throw boulders at great distances(Stone Giant are know for this ability!). Finding a boulder takes time, and picking up another will cost her an attack. She also wields a large club that allows her to attack from a short distance, utilizing the Reach ability. Being a Wild Giant hero, she can bond with the Dreadgul raiders. She offers some range to the Dreadguls(Though they already have that with Guilty), but she is not as big of a bruiser as other bonding heroes can be. Her sculpt is from the latest Pathfinders Battles release, Lost Coast and she is an Uncommon hero in that set. I was able to get her online for 4 bucks. Jaraptara looks interesting but the Rock Throwing could be implemented much more elegantly. I see no need for the Improvised Weapon power or the marker. to review. I don't see how you cleanly articulate that you have to spend a turn not attacking (on a land space) before you can use the attack again, without a marker. I'm not fond of losing a whole turn for it either. Huh. Well, I like the mechanic. And I wouldn't recommend the X Marker instead, if the designer would rather it be every other turn. to review. Looks good to me. I like the theme, and the bonding is interesting. from me. We're starting to fill up again in here, folks! Part of the design of the hero is the choice you have to make. Often you find yourself wading into melee and it's really hard to "not attack" and instead "reload". That is often a 5-6 normal attack you are giving up or a boost to the dreadguls who could be attacking as 4's instead of 3's. 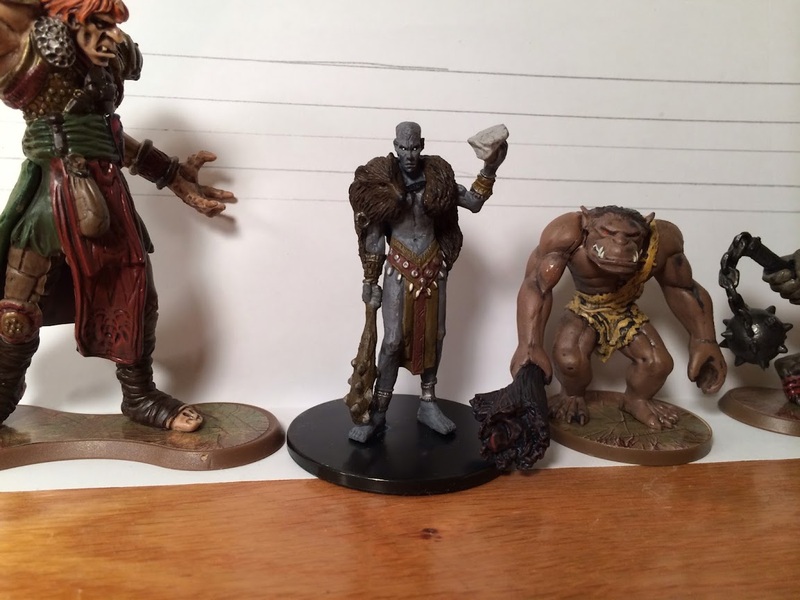 It brings balance to the figure and gives players choices. I believe part of what makes a good designed hero is the choices that the figure presents. I don't think there would be a better way to design the mechanic .